you couldn't find a better place than this! Your destiny made you find this eBook. You will find here how to come up with a good idea, how to motivate yourself to take action, you will discover the rules of how to become rich quickly, you will get to know the methods of creating effective (profitable) websites and mobile apps, but it's just a beginning. ...this eBook is a part of the 25­year­old Millionaire Project, that helps you to get the Angel Investors' financial support for the realisation of your business ideas. You can submit the unlimited number of your ideas, you can rate other users' ones, you can expand your knowledge (for free) and discuss with people from all around the world who are as crazy about business and earning money, as you. If it's still not enough for you, you can take part in the mind test and check if you have the mind of a millionaire. So, as you can see, this eBook is just a beginning of a fantastic adventure that will completely change your life. Are you ready for this? 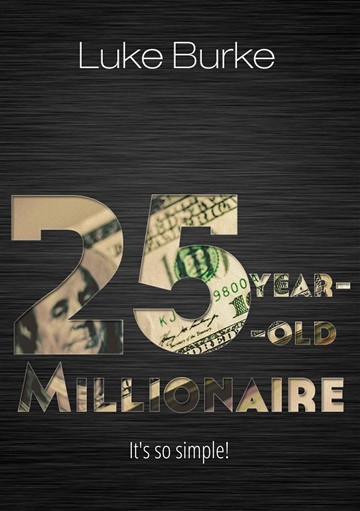 Luke Burke is a young, 25-year-old entrepreneur and the author of the "25-year-old Millionaire" eBook. After graduating high school, he decided to be self-employed and started working in his own company. He studied Psychology of Business for some time, but at last he decided to quit the University and focus on his business. His short career was full of collapses, because he started at the beginning of the latest crisis. His first business - real estate agency franchise - had no chances to exist, the second one - a consulting company - was closed after changes in law. Despite this, he never gave up and headed back on track. One day he changed his attitude, started to think and act GLOBAL instead of LOCAL - e-business was an ideal solution. Thanks to the Internet he could deliver his products and services to much more people than in traditional way. He decided to help other people in making money via Internet, and that's what '25-year-old Millionaire Project' is about.